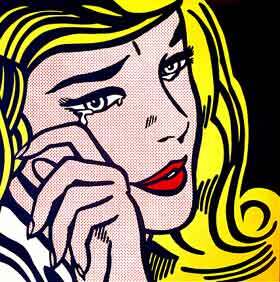 Roy Lichtenstein was a Jewish American pop artist. His thirty-five year career of public recognition was celebrated in 1993-94 by The Solomon R. Guggenheim Museum in New York with a large scale retrospective of his work. He was born in Manhattan and went to high school there. By age 14, he was taking art classes at the Parsons School of Design and also studied briefly with Reginald Marsh at the Art Students League in 1939. He then attended Ohio State University where his major influence was Hoyt Sherman, whose figure-ground relationships inspired Lichtenstein's treatment of cliche subjects. In 1943, he was drafted into the Army and served in Europe and then returned to Ohio State, completing his BFA and MFA and then teaching at that campus. 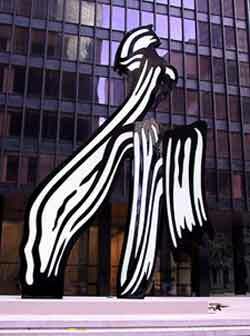 From Cleveland, Ohio, he made frequent trips to New York and started to exhibit there in 1949. In the 1950s, he used various techniques of Abstract Expressionism, did figurative work, and like many of his generation, began employing pop art images. But he was searching for a style. In 1957, he left Cleveland to teach at New York University in Oswego, New York, and in 1961, he began teaching at Rudgers University, where one of his colleagues, Allan Kaprow, used cartoon figures. Through Kaprow, he met many renegade New York artists including Claes Oldenburg and Jim Dine; it was a circuitous return to the New York from where he had a long journey. In 1962, he had a landmark exhibition at the Castelli Gallery that showed enlarged depictions of advertisements and comic strip images. In fact, it was gallery owner Leo Castelli who, as a major promoter of the contemporary art scene, was a key person in launching his career. Although Lichtenstein's pop paintings had widespread popular acceptance, he began in 1965 to do Abstract Expressionism, but in contrast to others in that style, he did work that was hard and static. In the 1990s, he did large-scale abstract interiors, and he also worked in ceramics and enamelled steel. Throughout his career, he appeared in many documentary films and did posters for entertainments including Bill Clinton's United States presidential campaign. 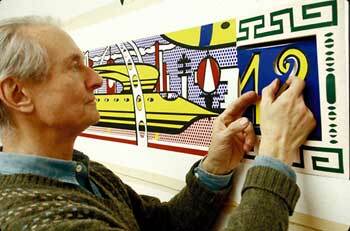 Lichtenstein's murals are in Dusseldorf, Germany; Tel Aviv, Israel; and New York City. He died unexpectedly on September 29, 1997, from virul pneumonia, having worked until the time of his death.